One of the most influential historians of ancient philosophy of the past half-century, Pierre Hadot was adept at using ancient philosophers to illuminate the relevance of their ideas to contemporary life. 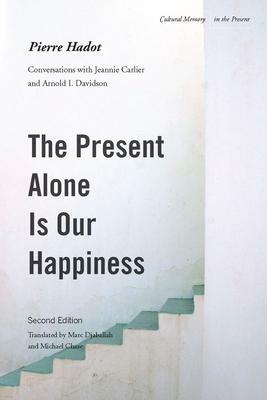 This new edition of The Present Alone is Our Happiness, which has been significantly revised and expanded to include two previously untranslated essays, is an ideal introduction to some of Hadot's more scholarly work. In it, we discover that to be an Epicurean is not merely to think like one; it is to adopt a way of living where limiting desires is the condition for happiness. Being an Aristotelian, similarly, is to choose a life that involves contemplation, and being a Cynic is to follow Diogenes in his refusal of quotidian convention and the mentality of ordinary people. If so many ancient philosophers founded schools, Hadot explains, it was precisely because they were proposing how to live life on a daily basis. We learn here that the history of philosophy has been something more than just that of a discourse. The founding texts of Greek philosophy, after all, were notes taken from oral exercises undertaken in concrete circumstances and contexts, most often a dialogue between students and specific interlocutors who meant to shed light on their students' real existence. The immense contribution of this book, which also traces Hadot's own personal itinerary in a touching manner, is to remind us, through direct language and numerous examples, what the theoretical aspect of philosophy often masks: its vital and existential dimensions.